The July/August 05 issue of FGBC World, the free paper distributed throughout the Grace Brethren world to better connect people and churches, went off to press just before noon today. Copies should arrive in homes and churches on or about July 1. 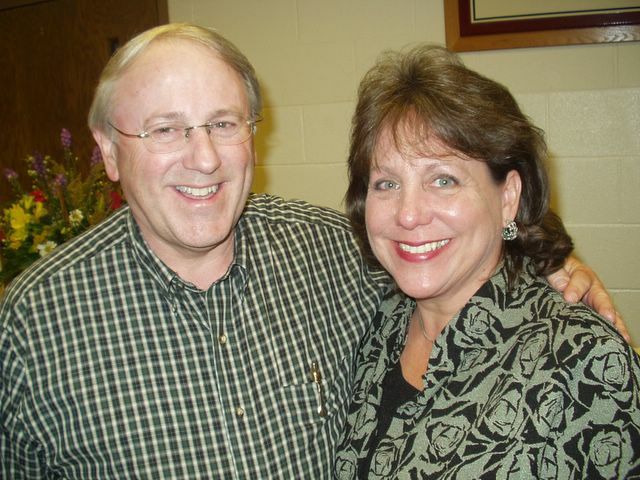 One of the front-page features is Norm and Ann Johnson (pictured), from the Ashland, Ohio, Grace Brethren Church, where Norm is associate pastor. Both lost spouses to cancer, and they have a most unique story about how God brought them together, and how they are now serving Him together as a married couple. Since Equip05, the Grace Brethren national conference is fast approaching, we’ll also share a “sneak peak” at another of the front-page articles which tells the variety of opportunities available at this year’s conference IN ADDITION TO the fine educational courses that are being offered. Remember that you may receive FGBC World free in your home just by requesting it. And please help the distribution in your church — help your church family know about our fine brothers and sisters in other Grace Brethren churches and organizations around the world. Registrations are strong and enthusiasm is high for the 20-plus courses that are being offered as part of the Grace Brethren national conference, Equip05, to be held July 31-August 5, 2005, in Winona Lake, IN. However, the conference is more—much more—than the excellent educational opportunities. Business sessions, inspiring plenary meetings, worship and devotional times, recreation, historical tours, open houses, and more will be available to individuals and families who are part of the Equip05 activities. The Association of Grace Brethren Ministers (AGBM) will begin the week’s activities with its only group meeting of the week at 4:30 p.m. Sunday, July 31, at the Winona Lake Grace Brethren Church. Current AGBM president Tim Boal will preside, and the meeting will include recognition of the Pastor of the Year, the Excellence in Ministry Award, and the Lifetime Achievement Award. The AGBM will have a picnic lunch at 6 p.m. following the meeting. The opening celebration of the national conference on Sunday, July 31, will be at 7 p.m. in the Rodeheaver Auditorium in Winona Lake and will feature music led by Jeremiah Olson, prayer for new missionaries, and opening addresses from Pastors Mike Lee (Raleigh, NC) and Neil Cole (Long Beach, CA). All plenary sessions are free and open to the public with no registration required. On Monday evening, August 1, will feature a gala dinner, GBIF anniversary celebration, and corporation meeting extravaganza. The Fellowship of Grace Brethren Churches (FGBC) will hold its annual business meeting, as will cooperating organizations including Grace Brethren International Missions, Grace Brethren North American Missions, CE National, The Brethren Missionary Herald Co., and Grace College and Seminary. Ashland, OH, pastor Dan Allan, current FGBC moderator, will conduct the FGBC business meeting. The Grace Brethren Investment Foundation is providing a free meal at the Rodeheaver Auditorium in honor of its 50th anniversary at the Monday evening event, and the buffet lines open at 5:30 p.m. The meeting will begin at 6 p.m. There is no charge, however meal tickets must be reserved in advance through the office of Fellowship Coordinator Tom Avey at www.equip05.com or by calling (574) 269-1269. When classes are over at 4:30 p.m. Tuesday, August 2, many cooperating ministries who have offices in Winona Lake will be holding Open Houses. Conference attenders may tour the homes of Grace Brethren International Missions, Grace Brethren North American Missions, CE National, Grace College and Seminary, or Grace Village Retirement Community. The Brethren Missionary Herald Company’s Open House will feature an autograph party with several of BMH Books’ best-known authors, including Dr. Homer Kent Jr. and Dr. John Davis. A chicken barbecue at Grace Village on Tuesday will be followed by a BMH-sponsored hymnsing in the Grace Village chapel at 7:30 p.m. A volunteer choir, led by Don Ogden, will rehearse at 6:45 p.m. in the chapel, and the hymnsing will feature Sharon White at the piano, Ed Lewis at the organ, Don Ogden directing the volunteer choir (including college alumni invited to sing “A Mighty Fortress”) and Miriam Uphouse Christiansen performing as Susannah Wesley. Open recreation will also be available Tuesday and Thursday evenings at the Gordon Recreation Center on the Grace College and Seminary campus at 7 p.m.
Wednesday evening’s celebration at 7 p.m. in the Rodeheaver Auditorium will feature the moderator’s address by the incoming FGBC moderator, Pastor Keith Shearer of the Myerstown, PA, New Beginnings Grace Brethren Church. Thursday evening will feature open recreation at the Gordon Center and, for those interested in the history of the Grace Brethren movement, Brethren Missionary Herald Co. is sponsoring a special “Brethren Heritage” bus tour. Narrated by Grace professor Dr. David Plaster and others, the tour will leave the Winona Lake Grace Brethren Church parking lot at 5 p.m. and will travel north to Camp Alexander Mack, for a tour of the monuments, a lecture on the Brethren history murals, and dinner on the grounds. Continuing north to Arnold’s Grove, the site of the 1882 Holsinger meeting, participants will hear a brief lecture, and the tour will conclude with a visit to the MennoHof Interpretive Center of Anabaptist History near Shipshewana, IN. A limited number of reservations for the Heritage Tour are available through Avey’s office at $25 per person ($26 online). The conference concludes Friday at 4:30 when the course modules end, although the following day, Saturday, August 6, the Village at Winona is sponsoring a special Billy Sunday Day and Ice Cream Festival which is open to any who can extend their conference stay. Each day during conference there will be a “jump start” in the Alpha Dining Commons on the Grace campus at 8 a.m. Jeremiah Olson will lead worship and a different pastor each day will lead a devotional after breakfast. Grace Village and Grace College and Seminary are also sponsoring nine holes of golf at the beautiful Stonehenge Country Club, and exhibits by many of the cooperating organizations will be available throughout the week at the conference center hub at the Gordon Rec. Center. As in years past, Brethren Missionary Herald Co. will produce a daily “FGBC Conference World” newsletter, available early each morning, to keep attendees informed of news updates and each day’s activities. To register for the Monday night business meeting, or any of the courses, log onto www.equip05.com or call the Fellowship Coordinator’s office at (574) 269-1269. A limited number of reservations are also available for childcare and children’s conference up through grade 6. Children must be pre-registered with the Fellowship Coordinator’s office. The 2006 national conference will be held at the Hyatt Grand Champion in Indian Wells, California, the week of July 29-August 3, 2006. Good idea to post news before the newspaper is delivered!